Jerome came to us after a very successful show career. He was a handsome fellow and a great example of the breed. He was what the breeder would term "bullet proof" - nothing fazed him. One of our favorite stories was during an overnight windstorm during which we couldn't sleep and the other dogs were on the bed with us trembling in fear, between gusts we'd hear the gentle sounds of Jerome snoring from under the bed. 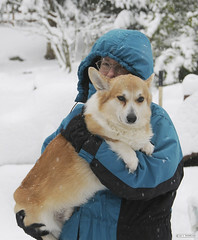 He bonded to Kathy who quickly became "his person" - if she had to leave without taking him for some reason, he'd wait by the door, or the fence, until she returned. 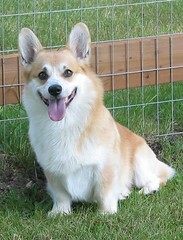 Besides the most common Corgi trait of all - a love of food - one of perhaps his most favorite things was to travel in the car, even though he'd typically fall asleep in the back seat shortly after getting underway. Towards the end of July 2009 ago Jerome began to cough, and it persisted. When it didn't go away the vet discovered that his lymph nodes were swollen and pressing on his trachea. The diagnosis turned out to be cancer: lymphoma. We opted for chemotherapy. 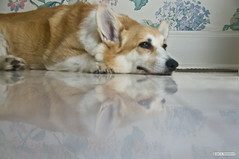 Our first Corgi, Vera, had also had lymphoma, and with chemotherapy had lived nearly a year after diagnosis. It was a good year as well, since chemo's not quite as hard on dogs. Jerome had a few bad days in the initial weeks of treatment, but overall seemed to improve for a while. However the cancer turned out to be aggressive and ultimately resistant to chemotherapy. Within just a few weeks it was back. None of the drugs we've tried over the course what would be about a month's worth of treatment had the impact we so desperately wanted and needed. As time wore on the chances for remission became ever smaller, as the cancer continued to spread. On September 10, 2009 x-rays confirmed that the cancer was as present as ever, and pressing on both his trachea and heart - making his breathing increasingly labored and difficult (his most obvious symptom, particularly at night). We made the heart breaking decision to let Jerome go. That evening he left us. Less than two months from symptom to death is just way too soon. 9 years old is just way too soon. After losing Guido to Degenerative Myelopathy earlier this year is just way to soon. That a pet will die should not be a surprise. We expect it, though of course we never like it. It's simply an inevitable outcome of choosing to intertwine our lives with those whose lifespan is so much shorter than our own. The surprise, the deeper pain, the downright UNFAIRness of it all is when that death is before its time. Suddenly a vision of what is and what will be is gut-wrenchingly replaced with only memories of what was, and the tragic loss of what might have been. It was all just ... way too soon.